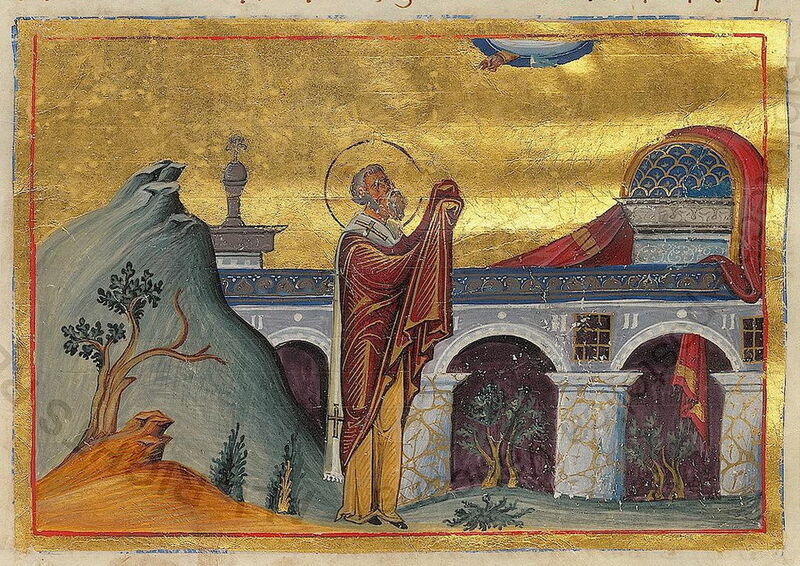 On the seventh of this month [December], we commemorate our Holy Father Ambrose Bishop of Milan. Being made worthy to partake in divine immortality. On the seventh Ambrose arrived in the land of immortality. Ambrose was from the great and glorious city of Rome, and was one of the royal senators. He always kept the truth in word and deed. He was familiar with the yoke and rule of justice, without making judgments and decisions by inclining in one way or another towards partiality. Rather he was upright and impartial. Hence through these virtues, he was entrusted with authority over all Italy by the pious Constantine and Constantius the sons of Constantine the Great. And although he was not perfected by Holy Baptism, but was still a catechumen, in virtue and purity of life he was no less than Christians who were perfected in Baptism and communed of Christ's Mysteries. 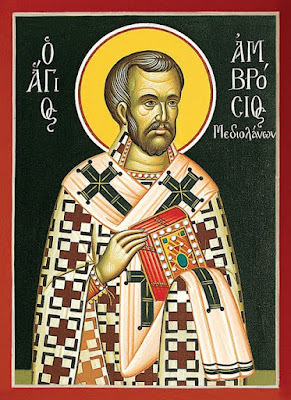 Wherefore after the Bishop of Milan died, with the judgment and decision of Emperor Valentinian, this great Ambrose was ordained Bishop of the Church of Milan, after being baptized one day, and the next day becoming a Reader. And in turn he passed through all the ecclesiastical orders, until he reached the greatest and most perfect Hierarchy. 1. 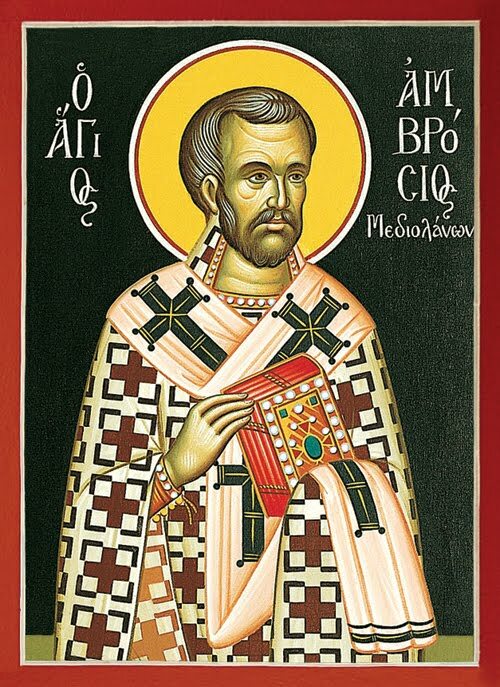 Basil the Great, in his letter to Saint Ambrose, says: "Not from men have you received or been taught the Gospel of Christ; it is the Lord Himself who has transferred you from the judges of the earth to the throne of the Apostles." The Life of Ambrose was written in Greek by Symeon the Translator, which begins: "Valentinian, after the death of Jovian." O Ambrose, wonderworker and champion of the Church, God-bearing Hierarch: thou didst work miracles by thy faith and love for God; therefore we the earthborn glorify thee and cry out: Glory to Him Who has glorified thee; glory to Him Who has crowned thee; glory to Him Who through thee works healings for all. Thou didst shine with divine doctrine and blacken the error of Arius; working miracles in the power of the Spirit thou didst heal various passions. 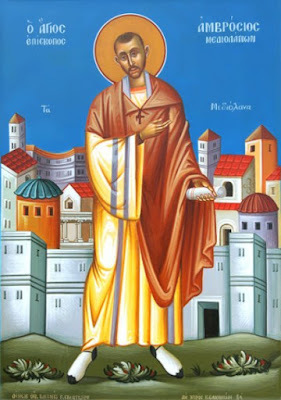 O Ambrose, shepherd and teacher, pray to Christ our God to grant us His great mercy.